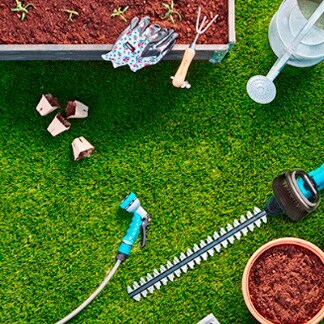 Whether sowing seeds, planting flowers or cultivating vegetables, we have the gardening accessories required to get you started. Why not get the season off to an early start by sowing seeds and using a grow light to help germinate them? During the spring, the seedlings can then be transplanted to a greenhouse, raised bed, flowerbed or vegetable plot. We also have plant troughs, planters, flower pots and zinc tubs to hold your plants. If extra support is required, we sell twine and wire for binding your plants to supports while they grow. If you like plants but don't have green fingers, check out our selection of artificial flowers and plants. Vintage style zinc garden planter.